Xian Hui, Governor of the Ningxia Autonomous Region, received H.E. Yahya bin Said bin Abdullah Al-Jabri, Chair of the Economic Zone Authority in Duqm (SEZAD) and his accompanying delegation currently visiting China as part of the Sultanate's participation in China-Arab Expo and "Invest in Duqm" promotional campaign organized by SEZAD in 3 Chinese cities. During the meeting, the Governor of Ningxia expressed gratitude to the Sultanate for its facilities to settle the Chinese investments in Duqm noting that these facilities helped speed up the construction of the Chinese Industrial City in Duqm. She confirmed Ningxia's commitment to invest in Duqm and implement the previously agreed projects between SEZAD and Wanfang Oman Company as part of the Cooperation and Development Agreement signed between the two sides in 2016, which provides for the implementation of about 35 projects with investments of about 10.7 billion dollars. The Governor of Ningxia Region praised the ties between the Sultanate and China and the two sides' efforts to promote economic cooperation to serve the two friendly countries and called for expanded cooperation between SEZAD and Ningxia Region. For his part, H.E. Yahya bin Said bin Abdullah Al-Jabri, SEZAD Chair, confirmed SEZAD support for Chinese investments in Duqm and provision of the facilities they may need. During the meeting, Al-Jabri briefed the participants on the geographical location of the Special Economic Zone in Duqm (SEZD) on the Arabian Sea, which is open to the Indian Ocean and its integrated infrastructure, including a multi-purpose port, a dry dock, an airport, a network of double and single roads and other infrastructures. He indicated that SEZAD provides many facilities and incentives to investors, notably tax exemptions and granting of usufruct rights for up to extendable 50 calendar years. The meeting touched on many other issues, especially the desire of both parties to expand cooperation and build long-term economic relations. The delegation accompanying H.E. SEZAD Chair includes H.E. 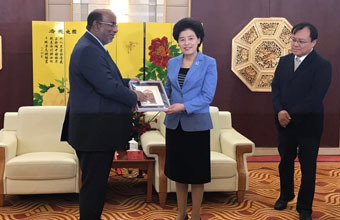 Sheikh Abdullah bin Saleh Al-Saadi, Sultanate's ambassador to China, and officials from the Ministry of Commerce and Industry, the Public Authority for Investment Promotion and Export Development (ITHRAA), and SEZAD. Meanwhile, H.E. Sheikh Abdullah bin Saleh Al-Saadi stressed that the economic relations between the Sultanate and China have witnessed a great development in recent years, praising Chinese investments in Duqm. "We have seen great interest from Chinese officials and companies to invest in the Sultanate and there is support from the central government in Beijing and the local government in Ningxia for this trend," said Al-Saadi in a press statement. He pointed out that the Sultanate's investment climate and political stability have contributed to encouraging Chinese companies to invest in the Sultanate, stressing that the Sultanate's embassy in China provides all the support and facilities needed by companies wishing to invest in Oman.